A few minutes from the villages of Tierras Morenas and Sabalito, this acreage has magnificent views in every direction of dormant volcanos, endless hills, and the Guanacaste lowlands with the Tempisque River system. 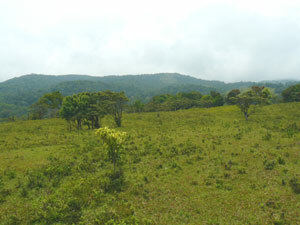 It fronts on a secondary road to the Volcan Tenorio Protected Area and borders a forested stream on the other end. Beside it is a large tree nursery owned by ICE, the national electric company. It is about a half-hour from the town of Tilaran. 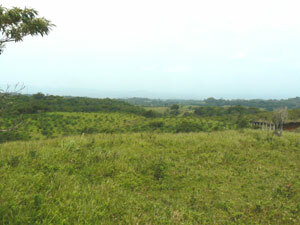 and about an hour from the international airport at Liberia. 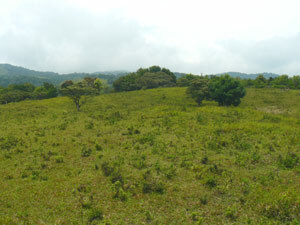 The acreage is easily buildable until it slopes into a forested quebrada at the back. 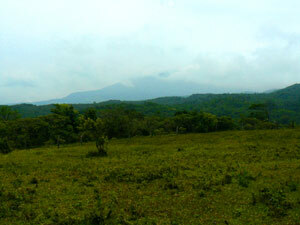 The property has views of three dormant volcanos ordinarily. Here's part of Miravalles. 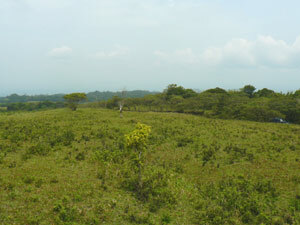 The neighbor on the south side is a goverment tree nursery, The village of Tierras Morenas is in the middle distance. 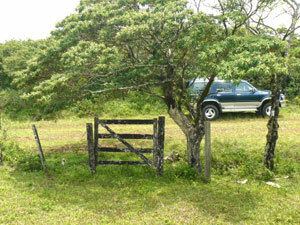 The entry gate to the property is beside a scenic secondary road that continues high up into the Volcan Tenorio Protected Area. The property is wide open for a choice of building sites, there being just scattered trees until the long, fairly narrow acreage descends to a stream in a forested quebrada.